This was a fun read! It is a romance but has a little mystery to it too, and the allure of time travel adds another layer of intrigue. I sat down to read "just a few pages" this morning and ended up reading for over two hours...actually that happens quite often to me with thrillers but very rarely with a romance novel. The story is engaging and the characters are relatable. I especially liked Blossom. I've noticed that so many romance novels follow the same guidelines: step one: meet cute; step two: one partner doesn't like the other and has to overcome feeling of dislike which are usually mixed with attraction; step three: flirting; step four: overcoming an obstacle that stands in the way of the couple getting together; step five: "getting together..."; step six: sometimes another obstacle; step seven: happily ever after. Out of the Blue does follow some of those steps but in such a way that I didn't realize it until I was finished reading and reflected back on the book. The time travel makes this one fun and the mystery of Brendan's shooting adds a lot to the story. 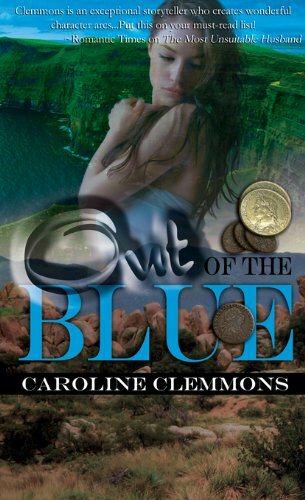 I also liked that while a romance novel, Out of the Blue was surprisingly light on bedroom scenes and heavier on the characters falling in love. This was the first Caroline Clemmons book I've read and I plan on reading more. Deirdre uses the word "lovely" too much. This book is more than just a romance novel. The story is compelling and the characters are endearing.